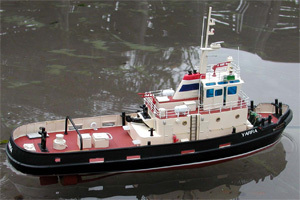 Yarra is a standard 90ft twin screw berthing tug. She was built by Carrington slipways ltd Tomago N.S.W, Australia. She was designed by Barnes & Fleck Pty Ltd Naval architects. Between 1972 & 1980 14 of these small powerful berthing tugs were constructed for service on the Australian coast. They specialize in assisting berthing operations of large bulk carriers, hence they are claimed to be the two most powerful engines in the smallest hull. There are many variations in the basic design, some with no drop in the bulwarks, different superstructure etc as they are modified at the design stage to fit various purposes. The model is based on a fiberglass hull with fender strips, freeing ports, and port detail molded into the hull. The main superstructure is also a detailed fiberglass molding with ladder recesses part of the molding. Computer generated plastic for the main deck and superstructure is LASER CUT from 1.5mm HIPs plastic sheet for fast assembly, also included is plastic printed in 6 colors and is used for fine detail and finishing on the superstructure to give quick and crisp assembly. A full set of fittings in cast light alloy and resin give the finishing touch to the model adding the vital clutter that is so much part of this attractive and powerful tug with so much appeal. A full set of water slide decals for the color full markings and computer cut cast vinyl name decals. As in all of the Deans kits a set of running gear is included, consisting of the props hafts, cast metal props and Shrouded propeller ducts and tiller arms. A full instructions keyed to a FULL SIZE plan with embedded color pictures to assist in the construction of the model, plus a c/d of approx 200 pictures of the build of the first kit. Painting instructions are part of the construction notes with tips for using car spray ACRYLIC paint which gives a fast and hard wearing finish.